Here at Home to Indy, we work with a lot of engaged couples who are looking for their first home together. We understand that paying for a wedding and purchasing a house simultaneously can be expensive, which is why we're all for saving a few dollars by doing as much as you can yourself. But some details of the wedding should be left to the pros. Read on for some tips on saving a buck without ruining your big day. -Invitations: It’s no longer a faux pas to send out invitations that aren’t thickly embossed on the finest paper available. If you’re pretty good with a computer, you can probably whip up your own in no time (or you can get a friend who’s good at design to do it for you as a favor). Many photo editing and word processing programs have templates that you can personalize for your own unique flair. -Flowers and Centerpieces: This might seem like an area best left to pros, but as long as you don’t require towering, complex flower arrangements, doing it yourself is a good way to save some serious coin. 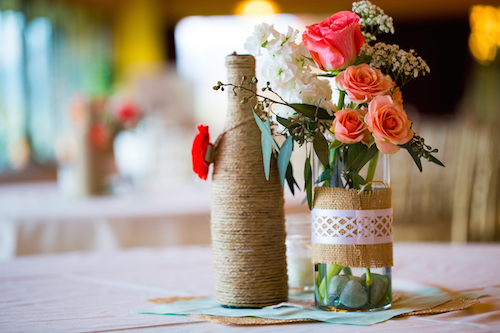 You can use items from the craft store, antique shops, or the internet to make your own simple and/or rustic centerpieces that match the theme of your wedding. Simple bouquets are easy to fashion from a quick trip to the flower shop, and single blooms make excellent boutonnieres for the groom and his attendants. -Photography: With the price of quality digital cameras falling all the time, most people know someone who fancies themselves a photographer. But don’t be tempted to have this person replace a professional. Unless they have experience shooting weddings, they won’t know which shots are essential and how to get the best smile out of your little ring-bearer nephew. And hiring a pro means you won’t have to worry about them socializing with guests and missing shots, either. -Food: Unless your wedding is extremely casual, you’ll probably be feeding your guests a meal. Even if you’re a great chef yourself (or if someone in your family is), don’t try to take on the burden or pass it off to a loved one. Preparing a delicious formal meal for a crowd is a LOT of work and requires precise timing, professional equipment and supplies, and lots of experience. If you want your guests to come away from your wedding happy and satisfied, go with a professional caterer. -Music: This might seem like a no-brainer to save some money. After all, just about everyone can put together a playlist and attach their smartphone to a speaker, right? But it’s important to keep in mind that a band or DJ does a lot more than just spin up the next song. They also usually perform Master of Ceremonies duties, giving the cues as the wedding progresses. In addition, they gauge the mood of the crowd and choose their song accordingly to keep the mood high—something you definitely can’t say for a prerecorded list.